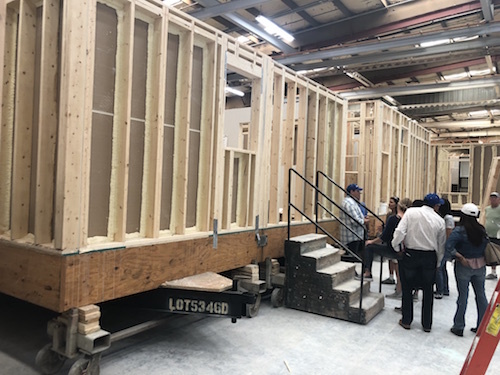 On June 9th CREST BACKYARD HOMES and SILVERCREST HOMES co-hosted an ADU Factory Tour. Crest Homes is a licensed Manufactured Home Dealer specializing in Accessory Dwelling Units and Silvercrest is a high line Manufactured Home & ADU builder in Corona (Riverside County) CA. There were over a dozen interested guests from the San Diego area that participated in the ADU Factory Tour. And folks left with a much better perspective and appreciation for the evolution of the manufactured home industry overall. Gone are the days when factory built was characterized by terms such as “trailer”, “coach”, or even the less flattering “wobbly box” , synonymous with low class living accommodations. “Trailers”, “Mobile Homes”, “Coaches”, etc. True, from the ’50’s through the late 70’s, they were nothing more than an oversized travel trailer. They were built using 2×3 exterior walls and 2×2 interior walls clad with a light thin gauged aluminum exterior siding and a flimsy 3/16 inch photo finished interior wall paneling. A “Singlewide” as they were called were typically a 10-12 foot wide by up to 60 feet in length and only weighed about 10,000 llbs. As proven by the ADU Factory Tour, they are as different today as a Chevy Nova and a Mercedes Benz. The exterior walls are 2×6 with 2×4 interior walls. 1/2 to 3/4 inch drywall replaced the flimsy interior siding and cementitious exterior paneling and even stucco has replaced the exterior lightweight aluminum. Today’s 12 foot x 60 foot “single wide” weighs 20,000 lbs +. They are also available with tile, metal, composition and wood or composition shingle roofs. There’s nothing wobbly about these structures any longer. Built to HUD standards, they have all the characteristics of a ground-up (site, stick built) home but with many added benefits and features. 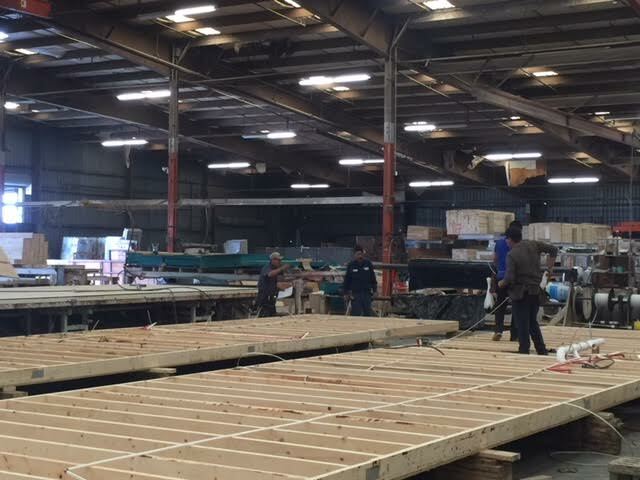 Unlike ground-up (site, stick) built homes, the entire process takes place indoors using kiln dried, straight and un cracked framing lumber and guess what? No nails. They have been replaced with an adhesive glue like foam that when dry holds even stronger than nails. Factory built backyard homes are available in myriad architectural motifs and design styles. They can be transported to a site and set by truck or crane rolled or lifted and set on a foundation wall or on an engineered and approved manufactured home foundation or “Engineered Tie-down System” (ETS). They can even be installed subterranean to give it a more streamlined California Ranch look. CREST BACKYARD HOMES & SILVERCREST have partnered up in San Diego with an exciting new line of Accessory Dwelling Units and the timing couldn’t be better with the new State laws that went into effect in 2017. Another ADU FACTORY TOUR: CREST BACKYARD HOMES & SILVERCREST is scheduled for Saturday, July 21st. Participation is limited to 25 and it’s first come first served so be sure to get your reservations in ASAP.